Prepay Hours allow you to sell blocks of service hours to be applied to an invoice at a later date. They can be tracked in reports, added to service level agreements and contracts or combined with discounts in the form of packaged deals. The customer knows what they pay every month and the business receives steady revenue whether the service is used or not. There isn't an option to add discounts on prepay hours. Discounts must be added using the same discount method for all invoice line items. 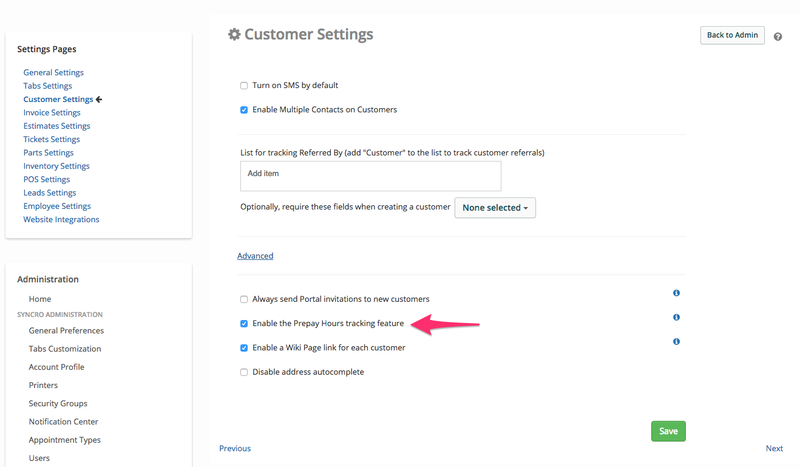 First Enable Prepay hours by heading over to the "Admin" tab and selecting "Customer Preferences"
Check the box that says "Enable the Prepay Hours Tracking Feature"
Then create a Prepay Hours inventory item. Head over to the "Inventory" tab and select the green "New Item" button. Fill in required fields, make sure select "Prepay Hours" as a category. This is very important and it is what will trigger the system to adjust automatically when an item with the "Labor" Category is added as a line item to an invoice. 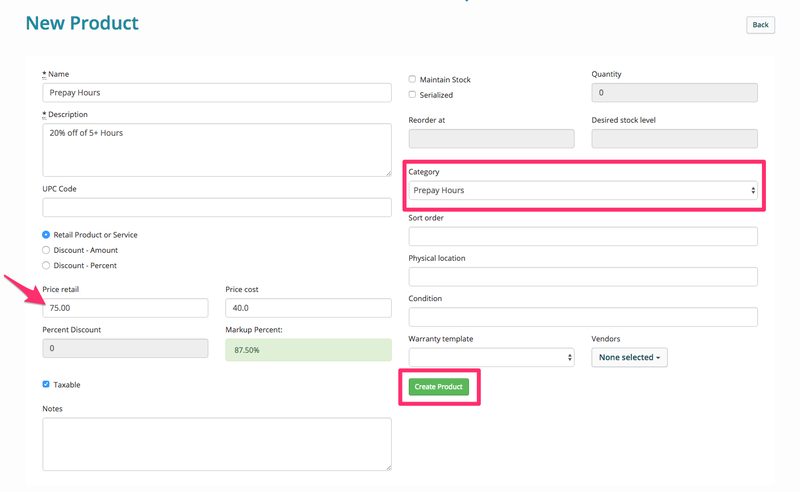 Set the price and then select the "Create Product Button"
You can now add Prepay Hours as a line item to an invoice. Complete check out by selecting the green "Take Payment" button. Inventory items with the category "Prepay hours" ADD prepaid hours to a customer account. Inventory items with the category "Labor" SUBTRACT these hours from the customer account. If you plan to have your Prepay Hours expire and reset at the end of the month you can set it up by following the simple steps below. 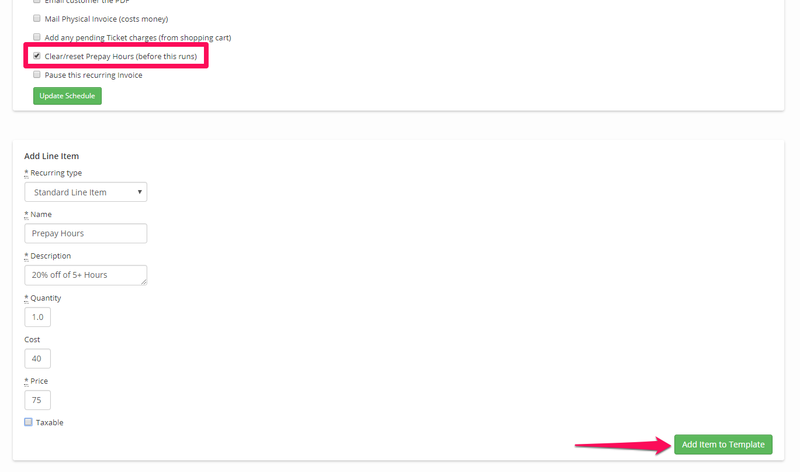 Head over to the "Invoices" tab" and select the "Inventory Modules" drop down. Then select Recurring Invoices and from there click on the yellow edit button to edit an existing Recurring Invoice. Check the box that says "Clear/Reset Prepay Hours (before this runs)"
Add the Prepay Hours item as a Line item. And you are all set!